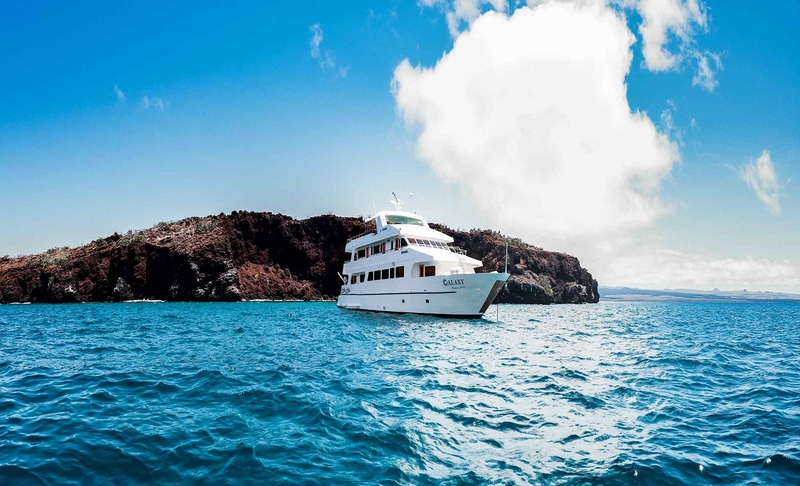 Journey through the Western and Central islands of the Galapagos aboard the exceptional Galaxy Yacht. 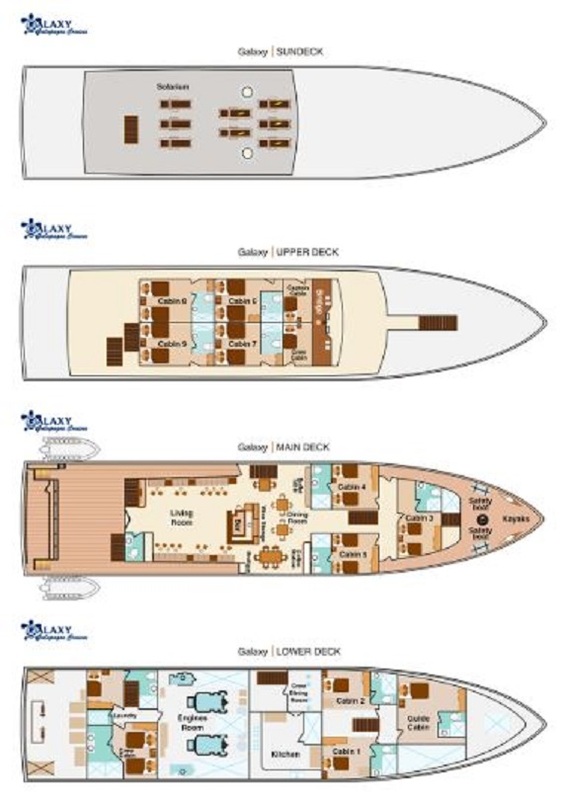 Accommodating only 16 passengers, its spacious outdoors will give you the best vantage point to enjoy this incredible destination. Experienced naturalist guides will ensure each day offers another incredible wildlife encounter. Arrive to Baltra Airport. Once you arrive, your guide will be waiting for you. 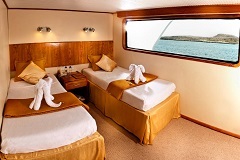 Transfer to Santa Cruz Island, we will be crossing the Itabaca Chanel (from airport to this place is around 15 minutes), after this we take our private bus to Puerto Ayora. 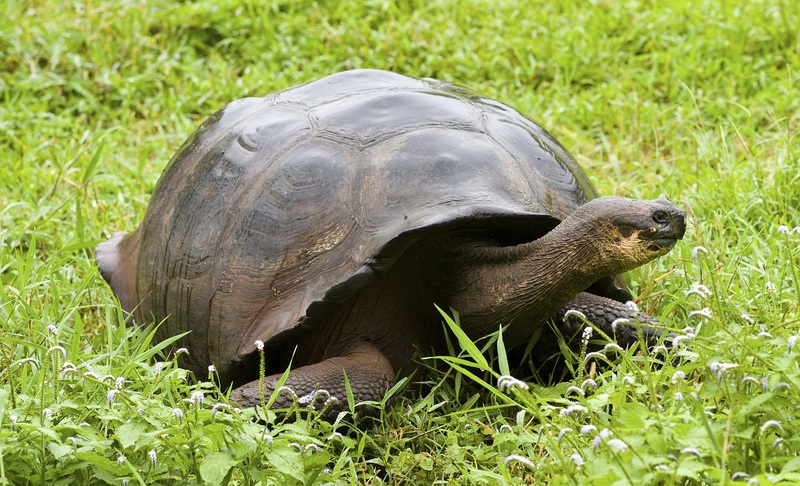 After lunch, our first visit is Highlands of Santa Cruz, where we will find giant tortoises in their natural habitat while trekking along the island. For this visit we recommend to use sport shoes, long pants, raincoat, hut and sun block. Back to Puerto Ayora. Located at south of Puerto Villamil, we will arrive to this place by panga. 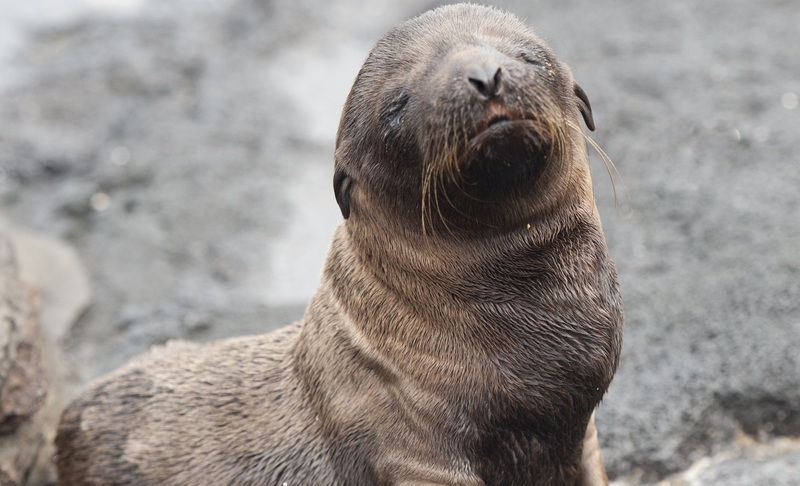 There is a small bay located in the area where you can appreciate sea lions, marine tortoises, marine iguanas and rays. For the most part of this trail, we will find volcanic lava of type AA from which is was made of. Tintoreras is one of places where the introduction iguana has been successful. 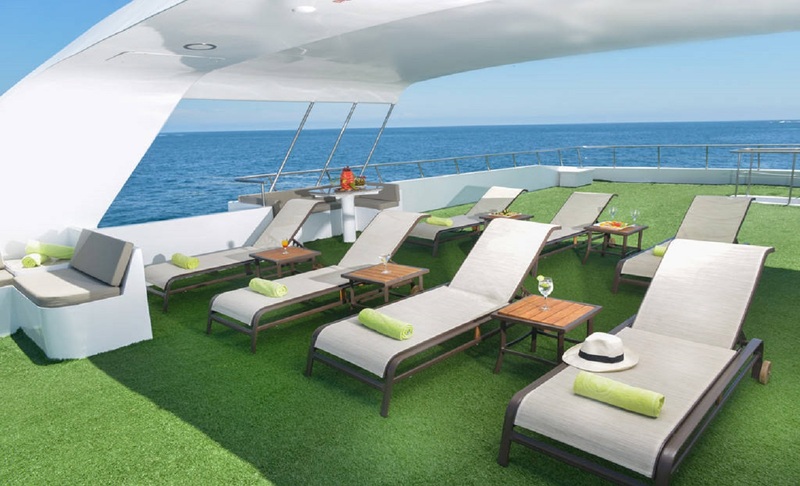 After lunch, we will disembark in Moreno Point which is located near Elizabeth Bay on the west coast of Isabela Island. 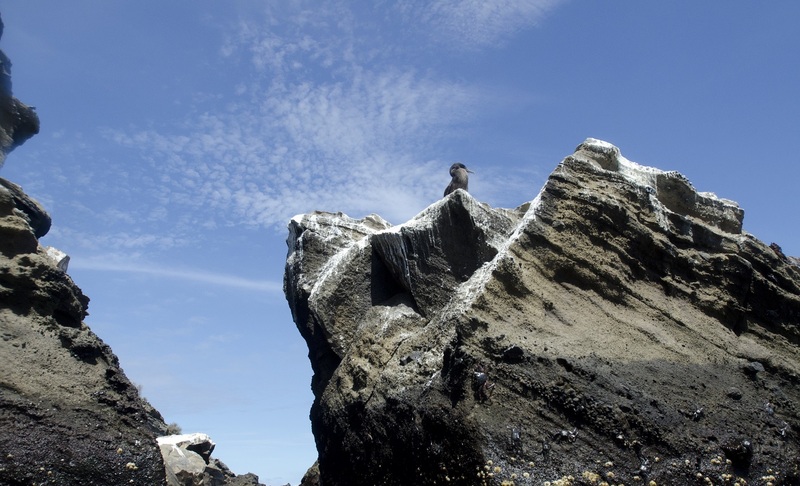 The plethora of birds seen during a dinghy ride along the striking rocky shores or a hike along path through lava rock leading to tide pools and mangroves create a birdwatcher’s delight. In the tide pools, green sea turtles or white-tip sharks can be spotted. This is one of the island's breeding sites for penguins. Located on the west coast of Isabela, Elizabeth Point is a marine visitor site. During our visit to the red mangrove cove, animals such as brown pelicans, flightless cormorants, spotted eagle rays, golden rays and sea lions are often seen. This place is located at the base of Alcedo Volcano between Elizabeth Bay and Tagus Cove (wet landing). Trail length is around 3.20 km; during this walk, we will be able to observe land iguanas, hawks, tortoises; as well as red and blue lobsters. 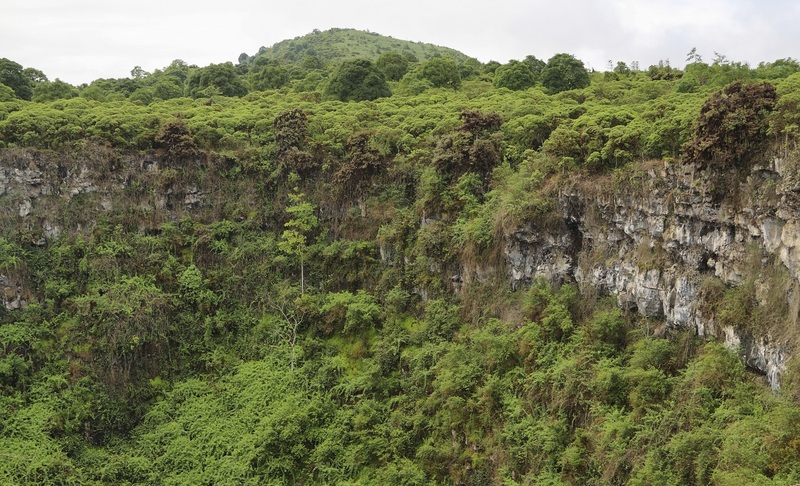 It is located at west of Darwin Volcano in Isabela Island. During our walking we will find several inscriptions (names of boat’s pirates) since 1800.The name 'Tagus Cove' originated from an England ship which crossed the island looking for Galapagos tortoise to feed the crew. From this area we can admire the Darwin Lake which has salt water and is approximately 9 meters deep. Unfortunately, no fishes can be views in this lake, however there is a vast range of different species of birds that can be viewed. 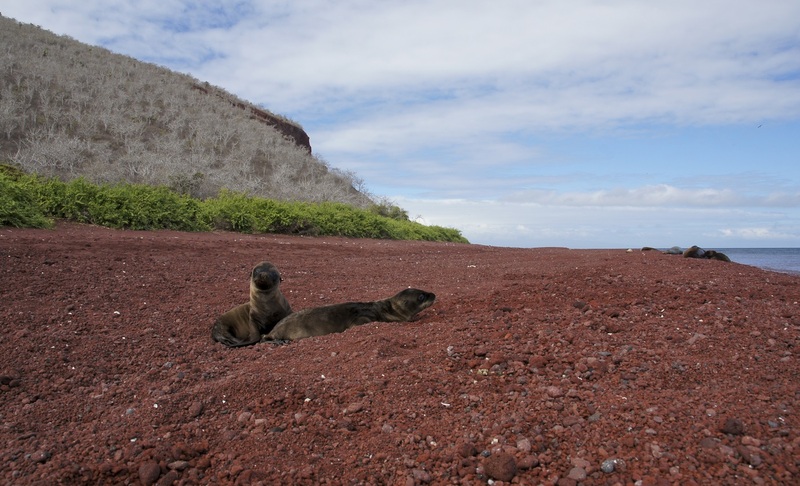 Fernandina is the 3rd island bigger of Galapagos and has just one visit place: Espinoza Point. 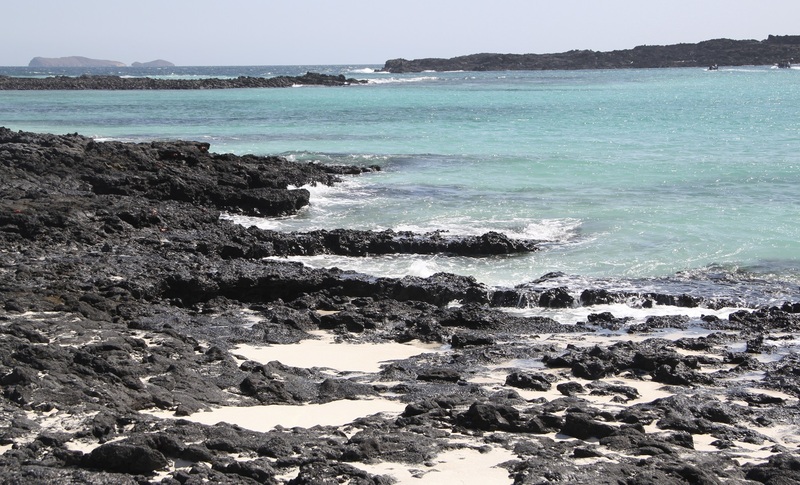 Espinoza Point is the only attraction in Fernandina Island. 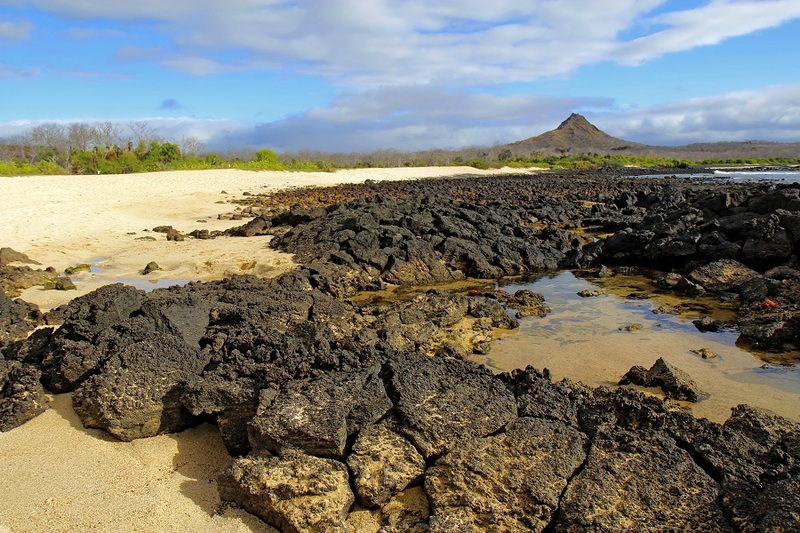 This site is famous for its big colonies of marine iguanas, only habitat for flightless Cormorant, Galapagos penguin, hawk, snakes of Galapagos and many other. From Espinoza Point we can admire Fernandina Island and its volcano which last eruption was on May 2005. This island is the only island that is not inhabited by mammals. 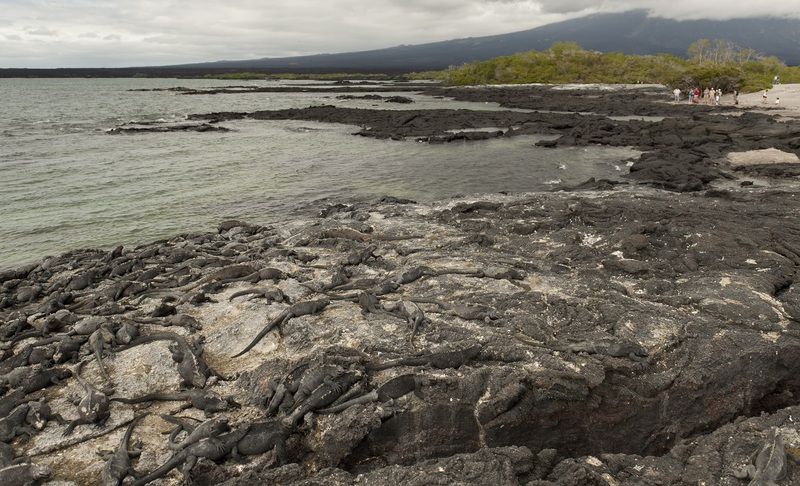 Due to its unique animals, its open areas are very fragile especially during nesting time of marine iguanas which occurs from January to June. Return to Galaxy. In this site we will find a black sand beach; at south of this beach there is a volcano called Pan de Azucar, its volcanic deposits have contributed to the formation of this black sand beach. The crater of this volcano has a salt lake which in warm time becomes dry and it is possible to appreciate a salt mine. Between 1928 and 1930 there were some explorations to this mine but they didn’t function; additionally, it caused damages to the environment because of workers use endemic woods. It is not allowed go down to salt mine. Return to Galaxy. One of the main attractions of this site is a Palo Santo wood, the beach and landscape; the beach is a very important site for tortoises because they use this place for nesting. The visitor’s site at Dragon Hill is located in north-western Santa Cruz Island, and consists of a trail that runs through three different environments at just 1,600 m long. After lunch our first visit is to Black Turtle Cove which is situated in the northern of Santa Cruz. 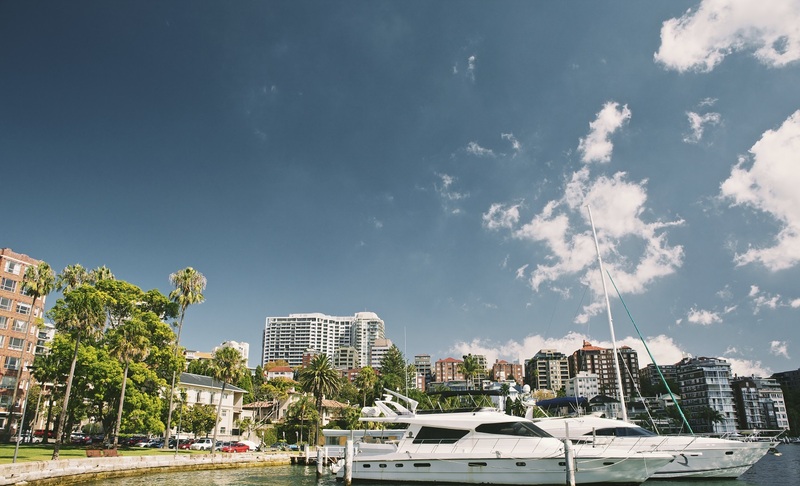 This bay is surrounded by mangroves and is accessible by dinghy only. The superficial cove is a safe refuge for marine life. Black-tip reef sharks, marine turtles, and a variety of rays are often spotted here. The visitor site is located on the east coast of Rabida Island which consists of a red sand beach, a coastal lagoon behind the beach, and a loop trail. The distance of this trail is approximately 1.1 km. The colour of the rocks and sand on the beach is due to the very porous volcanic material, which with the help of environmental factors (rain, salt water and sea breeze), has acted as an oxidizing agent. The main attraction of the place is the red sand beach, scenery, aside from the vegetation of the arid zone and the presence of native and endemic species. Chinese Hat is a small islet located near the south-east coast of Santiago. It's shaped like a Chinese hat when seen from afar. It is an island consisting of a cone type "Splatter" (lava ejected as drops and falls close to where it came from, which forms a cone inclined) that forms the summit and many lava tubes that go down to the coast. This island was formed by the lifting of volcanic marine lava. Marine fossil where found in this island; the fossil dates from Pleistocene. In 1932 the Capitan Alan Hancock and his crew took 72 land iguanas from Baltra Island and the iguanas were introduced in North Seymour Island; the reason of this change was that the iguanas could live in better conditions than in Baltra. The crew of Capitan Hancock found malnourished iguanas in Baltra; in 1934 colonizing people verified that the iguanas were in good conditions.